Beaches, boating, golf…and summer nights in your log home away from home! Lakes and mountains are always favourite places to play during the summer! Spend the afternoon on your boat or the golf course, tour a local winery: there’s more going on than ever to make you want to leave the city behind. Hiking, fishing and white water rafting can be unforgettable backcountry adventures, but finding suitable accommodations in remote locations can be challenging. Not everyone wants to pack a tent or make a long drive back to a hotel at the end of a round of golf or a day on the water. What about building a log cabin getaway that earns you money? Waterfront vacation rentals are pricey, and discovering a rustic retreat with the amenities you need close to off road activities can be difficult. Land prices near some of the BC interior’s most beautiful recreational areas, however, can be surprisingly reasonable. More and people are discovering that building a log cottage can be a great investment and an income property. Renting out your log vacation home for the weeks or months that you don’t need it helps generate revenue while making lasting memories for your family! Work less, golf more….pay yourself to go fishing! 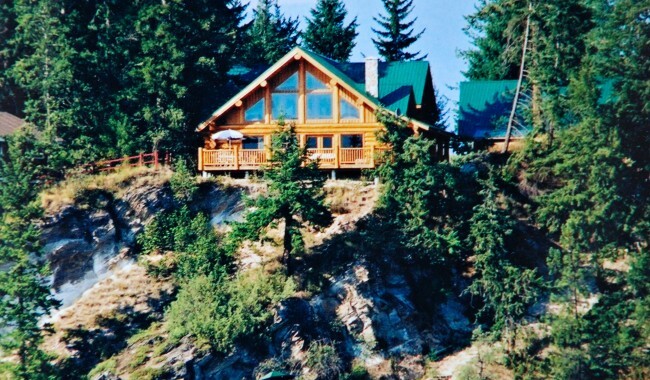 When you purchase a lot or acreage near your favourite golf course, boating lake, or mountain biking trails, keep in mind that custom log cabins can become popular vacation rentals and sought after destinations. Completed with quality furnishings and simple décor, the unique charm and character of your home will appeal to the clientele you desire. See things differently through the windows of your new log home! You can have a modern log home or cabin! Custom designs, professional craftsmen. Contact North American Log Crafters. Built in Canada, shipped worldwide. Call Toll Free: 1-877-955-2485.